WASHINGTON (AP) — Pakistan’s top diplomat on Wednesday urged the Trump administration’s new envoy for reconciliation in neighboring Afghanistan to be more sensitive to Pakistani opinion than he has been as a private citizen. The recent appointment of veteran U.S. diplomat Zalmay Khalilzad has raised hackles in Pakistan. Khalilzad, a former ambassador to Afghanistan, has previously called on the U.S. to declare Pakistan a terrorist state unless it stops harboring insurgents. While Qureshi was responding to a direct question on the issue, it’s unusual for a foreign diplomat to comment directly on how a particular U.S. official should conduct himself. Qureshi stressed the need for the U.S. and Pakistan to arrest the slide in their troubled relationship. Khalilzad will begin his first trip to Pakistan and Afghanistan as envoy on Thursday. He will also visit the United Arab Emirates, Qatar and Saudi Arabia, according to an announcement from the State Department. “Khalilzad’s mission is to coordinate and lead U.S. efforts to bring the Taliban to the negotiating table,” the Wednesday announcement read. The trip “reflects the Administration’s intent to support, facilitate, and participate in a peace process in Afghanistan,” it added. The Trump administration has taken a tougher stance toward Pakistan. It has suspended military assistance to the country, saying it isn’t doing enough to eliminate Taliban safe havens in its territory. It also wants Pakistan to use its influence to get the Taliban leadership to enter negotiations with the government in Kabul on ending the 17-year war in Afghanistan. 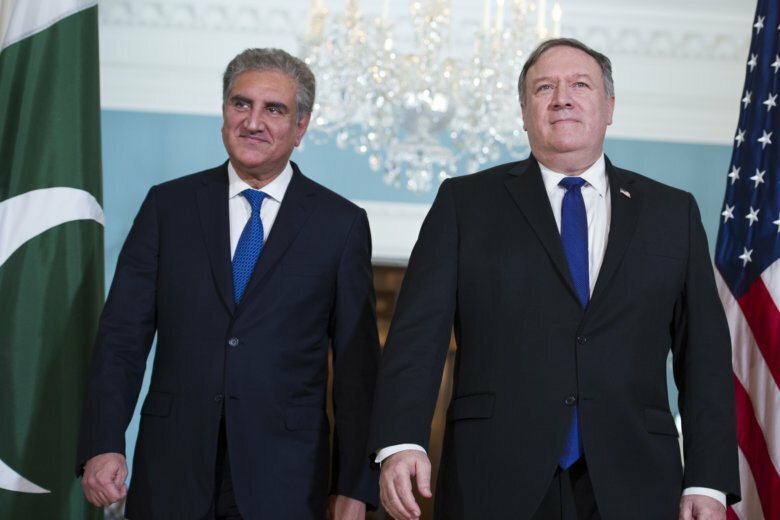 Qureshi criticized U.S. suspension of military aid but was upbeat about his talks on Tuesday with Secretary of State Mike Pompeo. Qureshi said there was a “convergence” between the governments in Pakistan, Afghanistan and the United States to seek a peace settlement to end the Afghan war. But the Taliban have so far refused to negotiate directly with Kabul, saying they want to talk with the U.S., which has about 14,000 troops in the country. Qureshi said Pakistan will “use all its influence” to persuade the Taliban to join a peace process, but its influence has diminished. The Taliban, he said, would have to feel that it’s in its interest to negotiate.